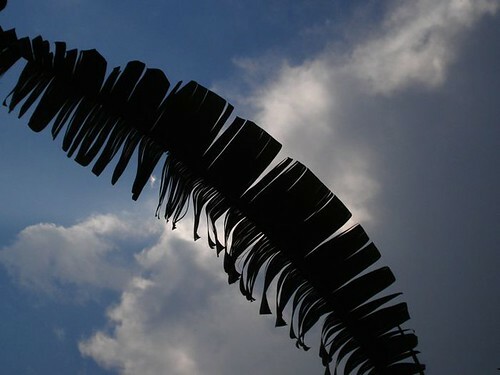 banana leaf and sky.jpg, originally uploaded by c_p_lew. I haven't fallen off the end of the Earth - but enjoyed a nice few days of the Lao New Year in Xieng Khouang. After making merit at the temple on Sunday, I went around to visit friends while other friends came to my house to visit me - sometimes missing each other. On Monday, I lounged around and read. In the evening I went to a friend's house for dinner. In the late afternoon, a thunderstorm blew up and the edge of the storm made for interesting lighting, especially behind the leaves of my banana trees. Usually younger banana leaves are paddle shaped and solid but Xieng Khouang is very windy so the leaves tend to get tattered like this.